“If stones could speake then London’s prayse should sounde who built this church and cittie from the grounde.” Above is the dedication stone for St. Columb’s Anglican church in Derry and within that is a smaller stone “said to have come from Derry’s mediaeval cathedral” (colmcille.org) which reads “In templo verus deus est vereq[ue] colendus” – In the temple is the true God and truly deserving to be worshipped. 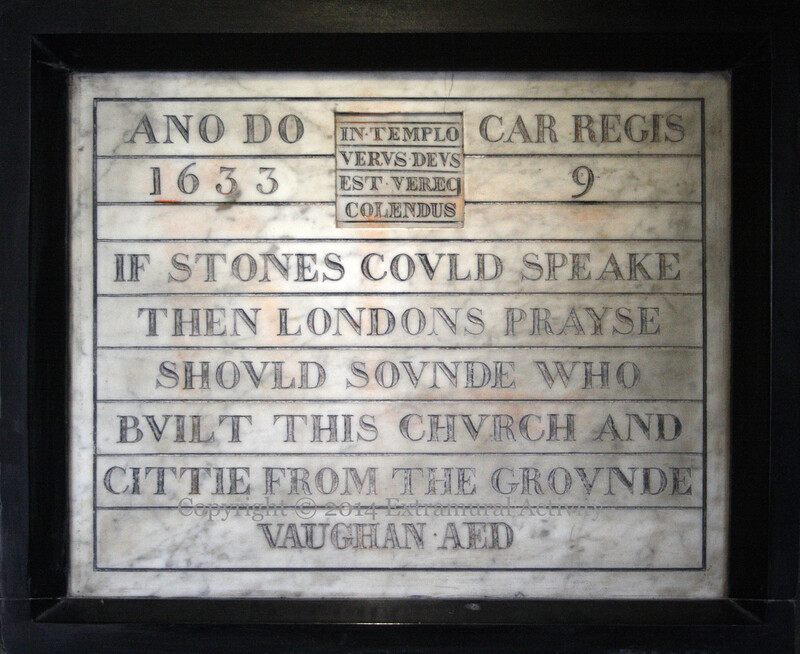 Ano do 1633 (Anno Domini – In the year of our Lord, 1633), Car Regis 9 (Caroli regis – in the ninth year of the reign of King Charles), Vaughan Aed (Vaughan aedificavit – built by Sir John Vaughan, Governor of the City of Londonderry; the builder was in fact William Parrott. Construction began in 1628 and was completed in 1633, at a cost of 4,000 pounds.